If you are looking for relaxation SPA with hot springs water with only 40 km from Cortona there is a place where to escape from your stress and contemplate the nature. In the province of Siena between the Valdichiana and the Val Ombrone stands Rapolano a small medieval town rich of hot springs water used since the ancient times to regenerate the body, mind and spirit. 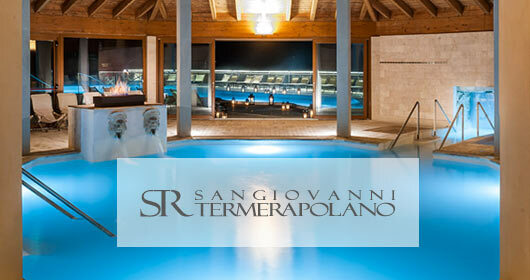 The historic Spa resort “Antica Querciolaia” at Rapolano Terme, is enriched by a new discovery. Inside of the spa you can find an is a travertine basin where in August 1867, Giuseppe Garibaldi took care of the injuries he suffered during the battle on the Aspromonte (Calabria, Southern Italy). The travertine bathtub was found in the mud area at that time dedicated for mud treatments. The bath tub is located under the dressing room where the hero of two worlds used to change before diving in the warm thermal waters of Rapolano. The springs of Rapolano, were known in the Etruscan and Roman eras for the properties of their healing waters. Popular today, these natural waters are recommended for the treatment of cardiovascular diseases, and also used in the treatment of diseases of the respiratory tract and for inflammation. From Cortona get the road higway E78 to Siena direction, exit to “Serre di Rapolano” (about 35 minutes). Follow the Rapolano town directions, then follow the sign to the hotsprings. (Terme) RAPOLANO DISTANCE 43,7 Km | Time to go 37 minutes. Bagno Vignoni is a town situated on a hill above Val d’Orcia in Tuscany, Italy. It is a popular tourist destination and well known for its hot springs. The ancient village of Bagno Vignoni is located in the heart of Tuscany, in the Val d’Orcia Natural Park. Thanks to the Via Francigena (which was the main route followed by pilgrims in antiquity who went to Rome), these thermal waters were found and have been used since Roman times. At the heart of the village is the “Square of sources”, namely a rectangular tank, of 16th-century origin, which contains the original source of water that comes from the underground aquifer of volcanic origins. Since the Etruscans and Romans – as evidenced by the numerous archaeological finds – the spa of Bagno Vignoni was attended by eminent personalities such as Pope Pius II, Saint Catherine of Siena, Lorenzo the Magnificent and many other artists who had elected the village as main holiday resort. Characteristic of Bagno Vignoni, besides the thermal waters, are its structure, despite numerous incidents of war, devastation and fires that involved the Val d’Orcia in the Middle Ages, remains essentially unchanged since then. From Bagno Vignoni, you can easily reach the historical centers of nearby Pienza and Montalcino, and the general Val d’Orcia area, including the Park of Mount Amiata. Bagno Vignoni is also the location where parts of Andrei Tarkovsky‘s 1983 film Nostalghia were shot. What in traditional towns is a main square, in Bagno Vignoni is a huge thermal pool, but you can’t jump in there, but here below we have providing two great hotels spa in town where yo’ll be able to enjoy the those wonderful thermal waters. If you like go wild and free you can try the “Parco dei Mulini” for a free bath just steps away from the town. For several years now I have been trying to understand the whole terme thing going on in Italy. I personally visited a few known for their combination hotel/spas in the past, oriented around pools fed by mineral-rich waters bubbling up from the earth below. Each time, I would swim around shivering in the lukewarm water until I got bored, have a massage that felt more like a friend applying sunscreen to my back, then, if I stayed the night, I’d join the herd of people gathering for a mediocre dinner (one establishment even served fake grilled shrimp). I couldn’t help but feel that something was missing. I knew that the Etruscans and later the Romans harnessed the healing powers of thermal waters enriched with calcium, magnesium, fluorine and sulfur, and visits to terme were an important part of their health regimen. In fact, the word ‘spa’ comes from a Roman tradition, ‘salum per aquam,’ which means ‘health through water.’ What I didn’t realize until I started to research this article is it that in modern times visits to the terme were widely prescribed by doctors in Italy. Treatments were heavily discounted, the state-run facilities were low quality and the clientele mainly comprised the elderly hoping to cure specific ailments. Several decades ago, private resorts sprang up in Tuscan towns like Montecatini, Chianciano and Rapolano. Italians flocked there on weekends and holidays to relax and unwind, taking advantage of discounted package deals. Time has taken its toll on many of these places and though you can still find decent facilities, the quality can vary dramatically. Most are comprised of several indoor and outdoor pools filled with mineral-rich waters of varying temperatures (even the warmest pool is cooler than the typical jacuzzi in the States). Depending on the mineral content, the water might look slightly opaque or the pool bottom might feel a bit slimy and rubbery underfoot. You typically wade around in the water for 15 to 20 minute sessions while the minerals work their magic, then relax on a lounge chair in between soaks. You’ll find locker rooms and often a steam bath and sauna, especially if there is a spa. 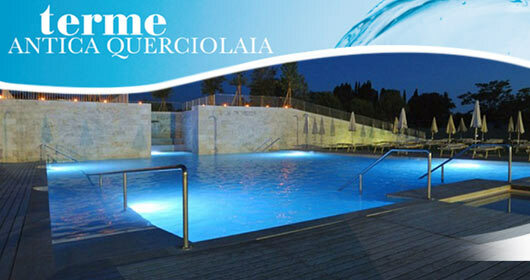 Day rates at the average terme range from 10 to 20 euro, and you need to bring a swim cap, flip flops, a towel and shampoo. Coming from one who has roughed it with the locals in homemade murky thermal basins and competed for space in overcrowded YMCA-like pools, when it comes to terme my advice is go for the best. You can visit even the most luxurious resorts and complexes just for the day at not much more than the cost of a nice lunch or dinner in Florence. My two personal favorites are in southern Tuscany, in an area where the waters rising from deep below the now dormant volcano, Monte Amiata, are particularly potent. 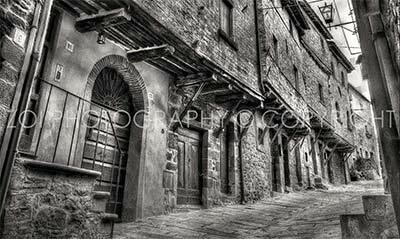 Southeast of Montalcino, where Tuscany meets the borders of Umbria and Lazio, lies the sweet little village of San Casciano dei Bagni. Its abundant thermal springs were a veritable healing Mecca for Etruscans and Romans. The sweeping panorama from the main piazza and lunch at Ristorante Daniela set in the old stone stables of the castle directly across, is worth the drive alone. A few kilometers further an iron-gated entrance beckons guests to Fonteverde. This stunning nineteenth century Medici palace was built over a portico constructed for Grand Duke Ferdinand I in 1607 around a particularly productive thermal spring. In 2002, the palace was purchased by Leandro Gualtieri, a trailblazer who created the first internationally branded Italian spa in Saturnia in the 1980s. The epitome of Tuscan elegance, Fonteverde’s sumptuous interior in deep red and green hues houses a substantial collection of original oil portraits from a palazzo Gualtieri owns in Florence. Below the palace’s hotel the sprawling thermal pools are surrounded by one of the most awe-inspiring views in all of Tuscany. I spent an entire afternoon just dipping in and out of the warm thermal waters and gazing out at that dazzling sight, occasionally slipping under the pounding waterfall to ease the tension in my neck and shoulders. The cost is quite reasonable at 19 euro on weekdays and 27 euro on the weekends, bathrobe included. Just like the majority of thermal spa complexes in Tuscany, at Fonteverde you can enjoy a formal lunch in your bathrobe at the hotel or grab a snack at the poolside café. The facilities offer over 100 spa treatments as well, which you must book in advance. I recommend the Bioaquam circuit in an indoor-outdoor pool with targeted jets that relieve tension, improve circulation, and exfoliate the skin. 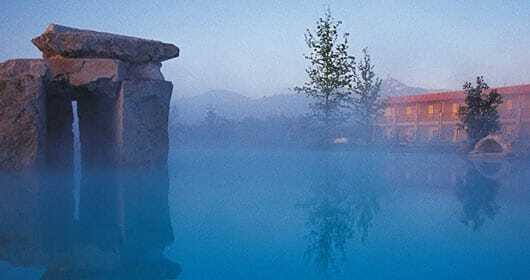 If you stay overnight, you can use the hotel’s private thermal pool. Dogs are welcome and in addition to receiving blankets and bowls, they can frolick with each other in the healing waters of their own puppy pool. Thirty kilometers north of San Casciano dei Bagni lies another treasure trove of thermal springs in the quaint little village of Bagno Vignoni where Lorenzo de’ Medici used to soothe his aching joints. The crown jewel is the Adler Thermae. The resort, which opened in 2004, is in such complete harmony with its natural surroundings that the buildings seem to literally rise out of the earth. Travertine stones underfoot were carved exclusively for the resort by a stonemason just down the road. Smooth, elegant walnut covers the walls in playful stripes. Light spills in through floor-to-ceiling windows that perfectly frame the stunning landscape beyond, and the scent of lemon wafting throughout is intoxicating. It is not easy to get in as a day guest (they limit the number to protect the experience of hotel guests), and it is not cheap. The entry fee is 50 euro and you need to book one treatment. Access to the fitness center and spa are included as are bathrobes, slippers and towels. It’s pricey, but trust me it is worth it. Just get there as early as you can and stay until the doors close. As soon as you lay eyes on the landscape, you’ll want to spend as much time as possible in the outdoor pools. Alternate soaks with sessions in the steam baths, the olive wood sauna and the steamy Grotto Filosofi, a real cave with stalagmites. At the spa, I recommend the Bacchus Ritual: a three-part scrub, bath and massage enhanced with Vino Nobile di Montepulciano that culminates with a glass of vino and a red rose. Whether you ‘re there for only a few hours or several nights, visiting a terme is a wonderful opportunity to relax, re-center, and break the rhythms of daily life. It’s a gift to your body and soul and opportunity to indulge in the pleasures of life, Italy style.